You don’t need a fancy degree or to spend thousands of dollars on charting and photography software, high end cameras, and photography equipment to become a knitting designer. Hard work, persistence, and dedication to learning is really all you need. What makes me qualified to teach you about knitting design? Well I’ve self and traditionally published 102 knitting patterns, and written a book and had an article featured in Knitty and had many patterns published in Knitcircus magazine since 2008. The current issue of Interweave Knits (Summer 2012) and Creative Knitting (July 2012) both feature positive reviews of my first book Leaves, Fickle Knitter Design Volume 1. My designs appear in 59 shops across 24 states and 3 countries. I teach classes on knitting design and participate as a vendor in knitting festivals all over the United States. Most importantly, I’ve mentored many designers over the years and I hope this tutorial will give you some guidance on what you can create on a budget. What do you hope to accomplish by writing knitting patterns? (In other words, don’t quit your day job just yet). Make a list of goals that you hope to accomplish. If you want to self publish, what steps do you need to take to do so? If you want to have a design credit in traditional publishing, what magazines or books do you want to be featured in? 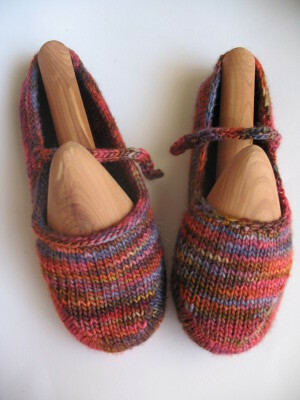 The Designers Discussion group on Ravelry is a fantastic resource. If you have a burning question about design this is the place to go. Between the Information Pages and the Search box (at the top above the topics and below the forums->designers group link) you ought to be able to find answers to just about any question including what magazines and books are holding submission design calls, and how you are compensated for your work. Anne, Corrina and Sarah work hard to keep the Designers group up to date and relevant. Look at your favorite knitting authors and make a note of what they do that you like. This goes for layout, photography, and style. This doesn’t mean that it’s ever okay to copy another designer’s work. Develop your own voice and standards and always put everything in your own terms. Your local library or knitting guild is a great resource if you are low on funds or do not wish to build a knitting book library of your own. You can borrow books through interlibrary loan, browse magazines and borrow books on every topic relevant to being a knitting designer from being a small business owner, marketing, to popular books by authors such as Elizabeth Zimmermann and Clara Parkes. Libraries are a ‘use it or lose it’ proposition these days, so the more we patronize libraries and teach our children to patronize libraries, the more funding they’ll receive (or so is my hope). Also don’t be afraid to talk with friends and family about your ideas, but don’t let them discourage you either. I learned far more about Microsoft Excel than I ever thought I needed to know in an evil senior level physics course entitled “Thermodynamics and Statistical Mechanics” which we students promptly renamed “Sadistical” mechanics. But you don’t need a degree in physics to learn Excel! Practice and experience and ease of use are what’s most important. Many folks have access to Excel and have some experience with it so this might be a safe choice to dip your toe in the knitting design waters. Aire River Font is a wonderful companion to charting in excel, and it’s free! Aire River Font grants permission to individuals and self publishers without royalty payments. Apache OpenOffice is a freeware version for word processing and spreadsheets and is an alternative to Excel if you don’t have access to the software. And Stitchmastery Font can be used in conjunction with OpenOffice for a minimal fee. Another low cost charting software option is Intwined Pattern Studio. I paid only $44 for my copy and it is useful for turning charts into written instructions. As with any plug and chug software, you’ll have to tweak the final product to fit with your standards. If you are low tech then Flickr may be a solution for photo editing. Although Picnik went away, aviary has some basic editing capabilities such as cropping, adding text, and resizing your photos. If you have more than 200 photos Flickr charges a very reasonable $25 per year to host your photos on their website. I’m a long time user of The GNU Image Manipulation Program, aka the Gimp. However, this free software has a huge learning curve! If you need to perform more complicated graphical tasks I would recommend checking out youtube and using google to find tutorials to get you where you need to go with this program. But as it is free, and if you don’t count the time spent teaching yourself how to use the software, it is much, much cheaper than the Adobe Suite, which ranges from about $1500-$1800 with the same level of difficulty in acquiring the skills needed to work with the software. For the self publishing I do for my books I have switched over to the Adobe Suite of products including Photoshop and Illustrator, because having something printed in a book form has a higher dot per inch requirement than the Excel-Aire River Font can provide. Also, Adobe Illustrator charts are vector and not raster based, meaning they can be resized for optimal viewing size. This is important when you are having something published in a book or magazine format, and is not as relevant when self publishing single patterns printed from a non professional printer. Anyone who insists that you need a top of the line DSLR camera is probably trying to sell you a camera. 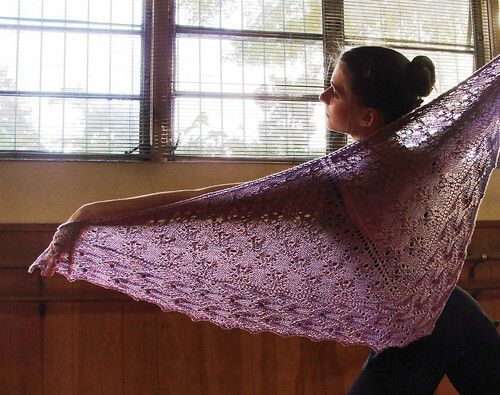 The Ballerina Shawl, photographed by Patrick Hough was done entirely using a point and shoot camera! However, he is very knowledgable about photography and knows how to set up a composition and portrait photography. This knowledge comes from many years of study and reading as well as practice. Please see your local library or check out what local extension photography classes are available in your area. Use White Posterboard as a background for small objects, photographed using natural, indirect light from a window in your home. One of my first patterns, Mama Janes were photographed on a simple white background, using indirect light from a north facing window in my home. This cost me zero extra dollars since I had everything but the (49 cent) poster board on hand. Ask your friends and family to model! But do yourself a favor and only ask people in your life who are enthusiastic about what you aim to do. No nay sayers allowed on photography day. Now I use a fancy medium format camera that I inherited from my sister when she unexpectedly passed away from pneumonia in 2011. But a camera is only as good as the person behind the lens! 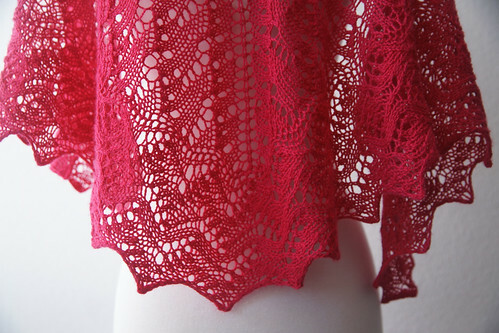 I photographed the Lisa Shawl (Currently #1 on the Ravelry Hot Right now list at the time of publishing) using my sister’s camera on a dress form in my studio. I’ve studied the light during the course of a day and know what time will yield the best indirect light. You can play some tricks with curtains to reduce direct light and also use (not free) equipment such as photo reflectors and studio lights. But sunlight is free, so learn about the natural light near you. Think I’m full of it? Above is one of my first knitting shots, where I didn’t even know how to rotate the photo so you can see me! 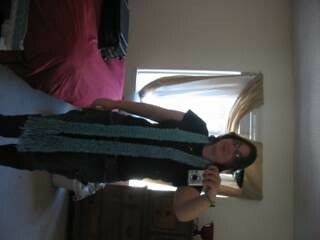 (The project was also one of my first, a stockinette scarf knit with Lion Brand Homespun). Proof positive that reading and application of what you’ve read can change your skill level. In the past 8 years I’ve spent a lot of time reading and practicing with my camera to develop the know how to take better photos. The above shot of the Baah Shawl begins my foray into modeled photography. You can see it’s worlds ahead of my homespun scarf photo and the main difference is personal experience. So borrow photography books from the library, ask your photography nerd friends, and practice, practice, practice! You don’t need a fancy camera when you’ve got the right lighting, and good composition. Do you know a photographer who doesn’t knit? Barter some hand knit socks for photography. Know a tech editor who you can trade a skill with? Bartering again is key. Same with your test knitters and graphic designers. Trade on your strengths and always be generous to the people who are helping you out. Bartering is a low cost way to get services you can’t normally afford. But respect “no” when people aren’t able to barter and move on. Tech Editing–Barter or realize that the cost of tech editing will help you sell more patterns in the future! Test Knitting–Ask trusted friends or family to test knit for pattern clarity. Good Photography–Learn the skills or barter! Correct mistakes as soon as you find them–Let your knitters know of an error via an errata page or email them updates. Apologize, then move on. 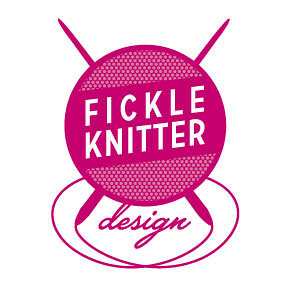 Independent Designer Program at Knit Picks is a wonderful place to start! Go in prepared. If IDP is no longer accepting baby hats because they have a surplus, then don’t submit a baby hat pattern! And don’t give up after being told no. Keep trying. There are also many online magazines such as Knitty, Twist Collective, Petite Purls and Clotheshorse that take submissions. Don’t forget the major publishers like DRG, Interweave Knits, and Soho Publishing. Ready for your first book submission? Try the lovely indie operation run by Shannon Okey, called Cooperative Press. Make a note of your responsibilities with each submission. Some publications provide technical editing, charting, layout, and photography services and some require that you provide those services with your completed submission. And learn to read a contract. Once you have a few solid, successful designs under your belt (which can be accomplished with self publishing and a bit of low cost advertising on ravelry) you may want to start asking for yarn support. Be aware however that yarn support comes with it a responsibility to the dyer. Be respectful of dyers and yarn companies if they do not provide you with support because this is a small industry and you never know when you’ll be tasked with dealing with these professionals in the future. Lay out terms that are agreeable to you and the dyer on what is to become of the yarn that you have received for yarn support. If you promise a design to a dyer, do everything possible to bring that design to press. Never take yarn and neglect to provide results because it makes all designers look bad. I hope that you’ve enjoyed my tutorial on How to Design Knitting Patterns on a budget. Below please enjoy some of my other tutorials that may help you on your knitting design journey. Thank you for posting all this great information! You have very lovely designs and its so nice of you to share all this knowledge. I have to say I love intwined pattern studio and have been using gimp for longer than I’ve been writing patterns. There is a learning curve but gimp does everything photoshop does for free. I also use the trifold presentation boards from jo-ann or a.c. moore for backdrops. I have one in each white and black. Lots of great info in this post Michelle! I like your sideways photo…you’ve come a long way! !